I was watching the Food Network a while back and saw a profile of the giant tenderloin sandwich from Indiana. Having spent eighteen years of childhood there, I had no idea that this method of preparing a tenderloin was unusual. The pork loin is pounded until very thin (and about 12" in circumference), then breaded and deep fried. It has the virtues of being (1) delicious and (2) ridiculously large. I highly enjoy both of these qualities. Anyone know where to get the giant tenderloin in Chicago? No, but I have seen the same in Iowa and the land beyond the Chicago metropolitan area. Illinois is a substantial pork producer where pork is heavily featured at community events throughout the state. Tomorrow, I will be in Magnolia, IL for Morel Mushroom festival. The local fire department fundraiser will have a grilled butterflied boneless pork chop sandwich. You feel pork presence in the Illinois economy everywhere but in the Chicago area IMHO. I agree with Cathy. At most fairs and rural gatherings in the state of Illinois (outside of Chicagoland), you can get a moist, juicy and tender pork chop sandwich, generally in the $3.50-4.00 range. I have seen the tenderloin sandwiches only in Indiana and very occasionally in Cincinnati. I've been buying boneless pork loin (lomo de puerco, a.k.a. lomo de cerdo) pounded out thin for years at Mexican butcher counters; in fact, there's about a pound of such Geschnitzeltes in my freezer at the moment. I use these cutlets in various Mexican, Italian and German dishes and often bread them and fry them. I haven't seen jtk's Indiana-style giant tenderloin sandwich anywhere in Chicago but it would be easy enough to make one at home, leaving all the butchering and pounding to the carniceros of Pilsen and La Villita (speaking some Spanish obviously helps). Caution: all too many large so-called pork tenderloins are flaked and formed rather than the classic sliced on the diagonal, butterflied and then pounded thin. One bite and you know the difference. I suspect that the decline of small to medium scale pork producers and the ready availability of the prepared monstrosities have combined to decrease the availability of good pork tenderloin sandwiches. ekreider wrote: Caution: all too many large so-called pork tenderloins are flaked and formed rather than the classic sliced on the diagonal, butterflied and then pounded thin. One bite and you know the difference. I suspect that the decline of small to medium scale pork producers and the ready availability of the prepared monstrosities have combined to decrease the availability of good pork tenderloin sandwiches. Yes, indeed. Nothing worse than ordering a Schnitzel -- or whatever that involves such an escalope -- and getting a meat patty... (This is one of the unforgivable crimes of Berghoff). 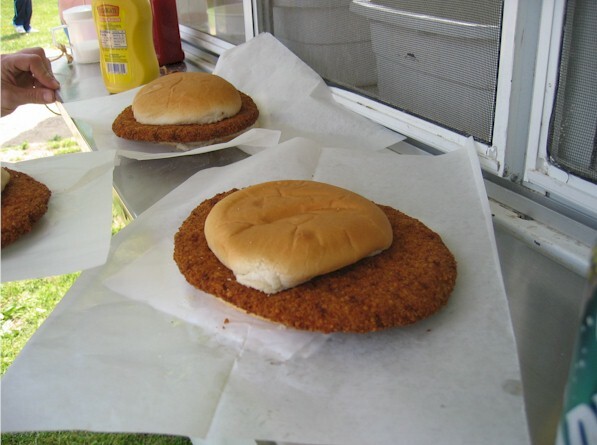 Growing up in Indianapolis, I certainly was familiar with the pork tenderloin sandwich, but never was a fan, probably due to inferior product being served in the metropolis. Maybe I should circle back and try some native product from other areas of the Hoosier State. The sandwich in question was generally referred to without reference to "pork" (just called a "tenderloin sandwich") and the ones I ate the most of, by far, were crappy imitation processed & frozen kind that were reheated in the school cafeteria. I think I may have had two total of the "real deal," both of which were eaten outside the city limits of Indianapolis -- but wasn't too enthralled with those, either, based mainly on a childhood aversion to pickles. (The archetypical dressing for a tenderloin, at least in Indiana, is yellow mustard and pickle slices.) Like so many Hoosier things, you really don't get the genuine article in Indianapolis, other than every August at the State Fair, at which time the urbanites on the North Side of Indianapolis are gently reminded what State they actually live in. If I happen to get to the State Fair this year I'll try to lay my hands on a tenderloin at the Pork Producers Pavillion -- which is really going to the source! I'm shocked to be able to use the culinary wasteland that is my hometown as a source for LTHForum but today may just be the day! You can get a huge tenderloin sandwich at Schooners in Bloomington, Il. Now, it's been over 20 years since I have even seen one of these but the memory remains. Schooners in is a pretty decent neighborhood bar and one of those places that I always mean to hit when I'm home but never manage to. They are also known for their "wings" (but, then again, is there a small, midwestern bar that isn't?) which is the real reason I've been wanting to get back there. But I definately remember splitting one of these with my brother as a youngster and I do believe it is what the original poster is looking for. 810 E. Grove St., Blm. P.S. 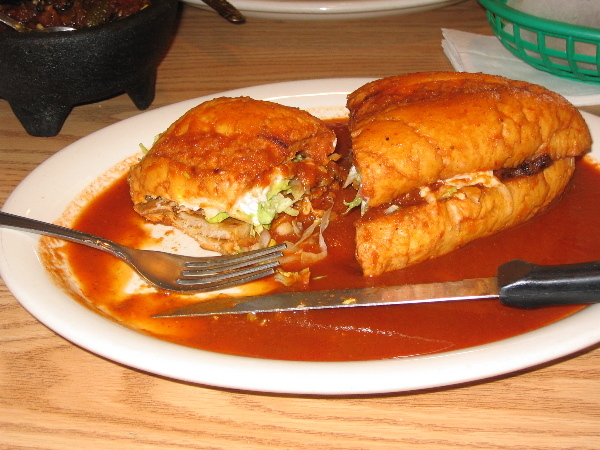 - there honestly must be a million small downstate Illinois pubs/bars serving this dish. I just refuse to believe that either Bloomington or Schooners are unique in this respect! I have a picture of a tenderloin sandwich from Magnolia, IL last weekend. The Sterns older Roadfood books provided directions for Pork Tenderloin sandwiches in Illinois. At a truck stop in Iowa somewhere along I-80, there is supposed to be a particularly memorably tenderloin sandwich the size of a Jaguar hub cap or at least pretty darn big. I am so behind on interesting posts, I will someday soon post the tenderloin pic from last weekend. Bridgestone wrote: Now, it's been over 20 years since I have even seen one of these but the memory remains. Schooners in is a pretty decent neighborhood bar and one of those places that I always mean to hit when I'm home but never manage to. But I definately remember splitting one of these with my brother as a youngster and I do believe it is what the original poster is looking for. As it happens, I drove down to Bloomington today. I had a local radio station on and heard a commercial advertising the the giant pork tenderloin sandwich at Schooners. So they're clearly still doing it. Here's a review of a Movie Documentary on the Hoosier Tenderloin Sandwich. jtk wrote: Anyone know where to get the giant tenderloin in Chicago? ohhhhhh the memories of going to college in eastern IA and having a tenderloin prepared like your description or grilled, used to have one at least once per week. FYI, you have another seeker looking for one in Chicago proper but I have not had any luck.